Look at you hot stuff! I love the dress! I LOVE your pink hair, really suits you! this outfit is amazing! love the leather collar..and your hair is just amazing! This is such a nice dress! Lumpy?! Oh my God, girl, I was going to ask if you lost weight because you're looking so slim! I'd kill for those legs! That dress looks gorgeous on you and those leather sleeves and cuffs add such a nice touch. They kind of 'rough up' the bodycon dress, which is a really feminine style of clothing. Woah, hel-lo! Stunning evening look. You don't look lumpy in the slightest you mad thing you. 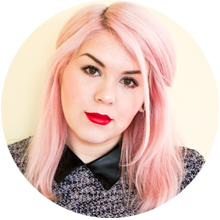 Loving the pastel hair too - you've got me itching to get something done to my hair pronto. Reading your blog is such a sin for me! Props for the Helpless Romantic badge too, gaw I loved that site. You look gorgeous! Bodycon stuff looks amazing on you. Amazing, your outfit is so lovely, as is your lipstick! suc a gorgeous outfit, love the flatforms! The dress looks so lovely and the red lipstick also looks fab!